Yucca brevifolia is a plant species belonging to the genus Yucca in the family Agavaceae. It is tree-like in habit, which is reflected in its common names: Joshua tree and Yucca palm and Tree yucca and Palm tree yucca. This monocotyledonous tree is native to southwestern North America in the states of California, Arizona, Utah and Nevada, where it is confined mostly to the Mojave Desert between 400-1,800 m (2,000-6,000 feet). It thrives in the open grasslands of Queen Valley and Lost Horse Valley in Joshua Tree National Park. There are two subspecies, including Yucca brevifolia ssp.jaegeriana Jaeger Joshua tree or Jaeger's Joshua tree or Pygmae Yucca. 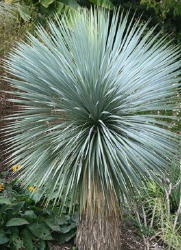 Other subspecies have been proposed but rejected by botanists, including one reduced to a form, Yucca brevifolia f. herbertii (Webber's Yucca or Herbert Joshua Tree). Joshua trees are slow growers; new seedlings may grow at an average rate of 7.6 cm (3.0 in) per year in their first ten years, then only grow about 3.8 cm (1.5 in) per year thereafter. The trunk of a Joshua tree is made of thousands of small fibers and lacks annual growth rings, making it difficult to determine the tree's age. This tree has a top-heavy branch system, but also has what has been described as a "deep and extensive" root system, with roots possibly reaching up to 11 m (36 ft) away. If it survives the rigors of the desert it can live for hundreds of years with some specimens surviving up to a thousand years. The tallest trees reach about 15 m tall. New plants can grow from seed, but in some populations, new stems grow from underground rhizomes that spread out around the Joshua tree. The leaves are dark green, linear, bayonet-shaped, 15-35 cm long and 7-15 mm broad at the base, tapering to a sharp point; they are borne in a dense spiral arrangement at the apex of the stems. The leaf margins are white and serrate. The flowers are produced in spring from February to late April, in panicles 30-55 cm tall and 30-38 cm broad, the individual flowers erect, 4-7 cm tall, with six creamy white to green tepals. The tepals are lanceolate and are fused to the middle. The fused pistils are 3 cm tall and the stigma cavity is surrounded by lobes. The fruit that is produced is green-brown, elliptical, and contains many flat seeds. Joshua trees usually do not branch until after they bloom (though branching may also occur if the growing tip is destroyed by the yucca-boring weevil), and they do not bloom every year. Like most desert plants, their blooming is dependent on rainfall at the proper time. They also need a winter freeze before they will bloom. FruitOnce they bloom, the trees are pollinated by the yucca moth, which spreads pollen while laying her eggs inside the flower. The moth larvae feed on the seeds of the tree, but enough seeds are left behind to produce more trees. 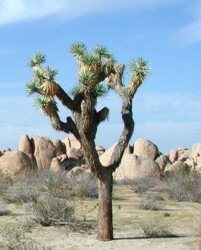 The Joshua tree is also able to actively abort ovaries in which too many eggs have been laid. Yucca rostrata, Agave Family ( Agaveae or Agavaceae ), Beaked Yucca. Also called: Big Bend Yucca, Soyate, and Palmita. Beaked Yucca is a slow-growing tree-like yucca. Often it has only one trunk, which can grow to about 12 - 15 feet tall. It has 2 foot long, stiff, slightly waxy, pale bluish-green leaves with yellow margins that form a dense rosette on top of the stems. When the old leaves fall off, they leave a fibrous soft gray covering on the trunk. 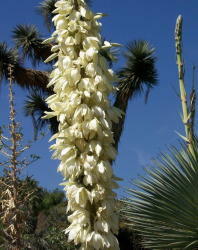 Yucca rostrata has large clusters of white flowers which bloom on itstall stalks in the spring. It grows best in warm sunny areas. Can take full sun in Phoenix or Tucson. Height: Up to about 12 - 16 feet tall. Spreads about 6 - 8 feet. Flowers: Its flowers are creamy white and bell shaped. It blooms in late spring on a 5 to 6 foot stalk. Blooming Time: Phoenix Arizona, Mid April - May. Leaves: The leaves are long and blue in color, tipped with a spine. The leaves are about 3 feet long by about 1 1/4 inches wide. Found: Native Chihuahaun desert, Texas & Mexico. In limestone gravels. Elevation: 0 - 4,600 Feet. In Arizona. Habitat: It grows well in sand, sandy loam, clay and other heavy soils. It needs good drainage and aeration. It is remarkably tolerant of alkali. Maintenance: Low. Hardiness: 15 - 20° F. Photos Taken: Boyce Thompson Arboretum, Superior, Arizona. May 13, 2008. (Adam's Needle) Yucca 'Color Guard' is a tough-as-nails plant that is ideal for a no-maintenance garden. The sword-like foliage radiates upward from a central crown, remaining upright all year round except in the heaviest snows. 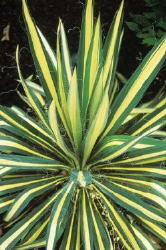 Yucca 'Color Guard' bears bright creamy-yellow leaves with green edges. During the cooler months of fall and winter, the light leaf centers take on rose overtones. From early to midsummer, spectacular sturdy flower stalks rise 3-4 feet tall from the center of the plant. The individual bell-shaped flowers are 2-3 inches long and dangle from the stems like earrings. Yuccas thrive in any type of well-drained soil including those that are very dry. Though they will grow in partial shade, they reach their full potential only if they receive sun all day long. 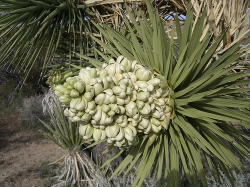 Many yuccas do not bloom until they are mature. Once they start, though, you will see that they were worth the wait. The flower stalks retain some ornamental value after the blooms have faded. Mature plants sometimes develop plantlets near their base. These can be dug and transplanted elsewhere if desired.